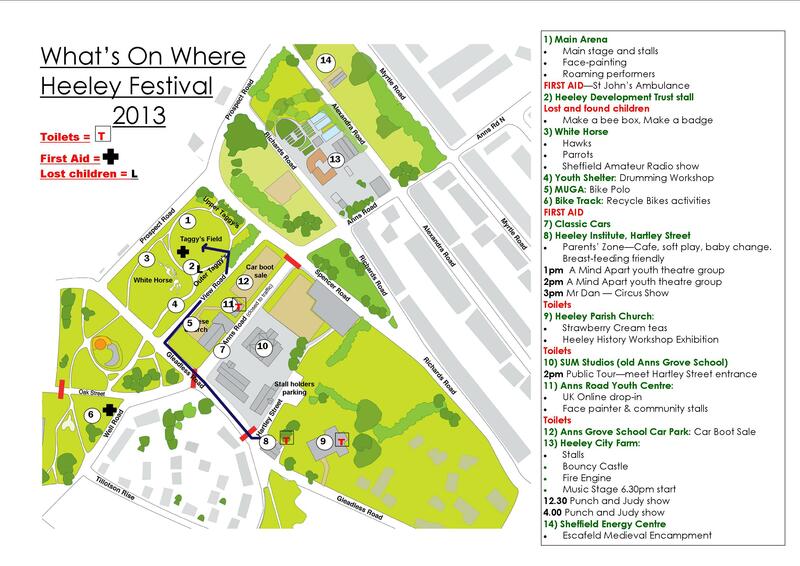 Heeley Festival 2013 | IT'S HAPPENING IN HEELEY! It is once again that time of year when Heeley comes alive with the sights and sounds of the fantastic Heeley Festival! This year’s event, on Saturday 22nd June, 12-5pm, promises to be one of the best yet, with a lengthy line up of features and attractions for everybody to enjoy. Heeley Millennium Park will once again play host to Big Al’s Main Stage of music and dance, parrots and hawks, bike and climbing activities, African drumming, children’s rides, woodland crafts workshop and dozens of stalls. Anns Grove School will host the annual Car Boot Sale fundraiser for those keen to pick up a bargain and Heeley Parish Church will be serving their delicious Strawberry Cream Teas and showcasing work from the Heeley History Workshop. Parents needing a cuppa and a sit down can head to The Heeley Institute for an afternoon of activities for the kids, including Magic & Circus Shows and the Classic Car Show will return bigger than before! And last but not least, over on Heeley City Farm there will be a Farmers Market, medieval activities & performance in the Roundhouse, fire engines, Punch & Judy Show, animal petting and a second music stage until 8pm! Come down and join in this great day out for all the family. will you be creating an Event on Facebook to increase awareness of the festival? 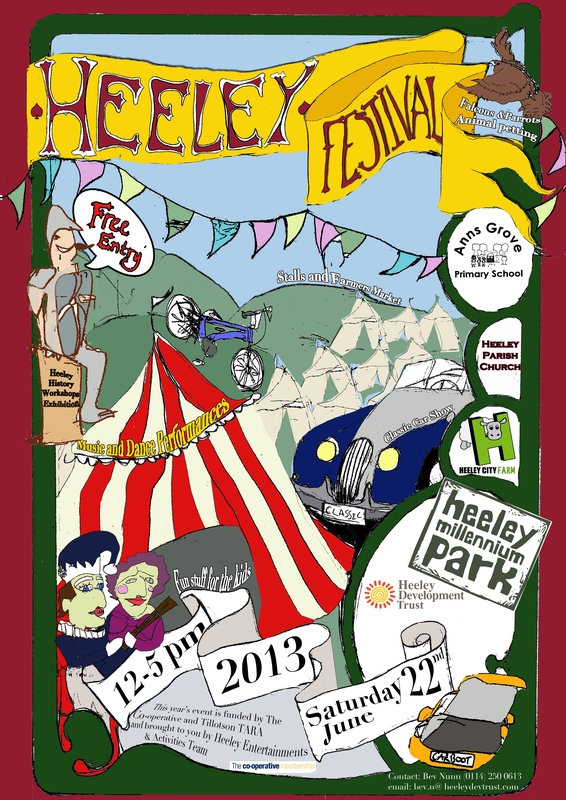 Search on Facebook for Heeley Festival and the Community Page should pop up, together with the 2013 event. Please ‘like’ and ‘share’ – let’s spread the word! How can I book a car boot place and what time do car booters need to arrive? On the day of the Heeley Festival, Alexandra Road Community Garden will be holding a Table Top Sale from 12 noon to 2.00 p.m. (weather permitting). Alexandra Road is just up the hill from Heeley City Farm cafe and the garden is just over halfway up the road on the left hand side. It will be another chance to pick up some bargains, or if you have things to sell bring a blanket/table and make a donation to the garden funds. Alexandra Road Community Garden was set up 20 years ago and is run by a small group of volunteers. For more information about the garden, events or volunteering please contact Jane Beale on (0114) 2498811. Curtain Call Performance Group will be at Heeley Festival this year holding a stall on Heeley Park. If your interested in children’s birthday party packages, special deals for community groups, or weekend drama classes for children aged 5 years – 18 years. Come and talk to Jo on Saturday.